Another Stanley St monument to the past is the Allgas Energy Building in Southbank Parklands. This building, pictured below in 1900 or thereabouts, was then the South Brisbane branch of the Queensland National Bank, and we have seen it before in this post. This building has a varied and interesting history. Originally named Caledonian House, it was built in 1885 for the well-known drapery firm, Allan and Stark. 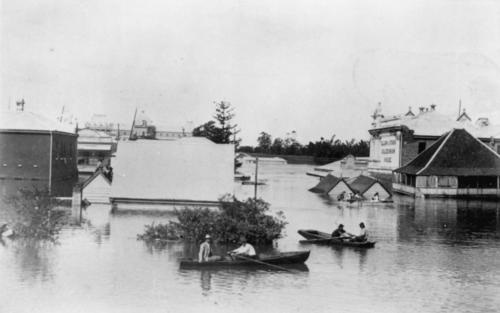 Brisbane had a bad flood in 1890, and an even worse one in 1893. These floods caused so much damage and created so much pessimism about the South Brisbane riverfront area that many businesses uprooted and set up again across the river in Brisbane. Allan and Stark was one of these - in 1893 their building was flooded up to the first floor, as seen in the photo above (the building is at the right rear of the image). 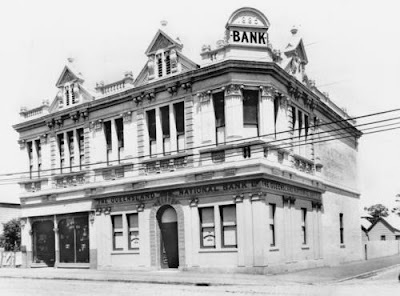 After the flood receded, they moved to a building designed by Richard Gailey in Queen St. Caledonian House was firstly leased to the Queensland National Bank in 1897 and the bank purchased the building in 1909. The South Brisbane Gas & Light Co leased a portion of the building in 1897, and remained there after the building was purchased by the bank. The building went through a series of different changes and was eventually bought by South Brisbane Gas & Light in 1967. This company became Allgas Energy in 1971. Here is a current view of the building. This building was used as both a bank branch and an administration centre during Brisbane's Expo '88. After Expo, it was refurbished and remains an administration building at Southbank Parklands.